Batumi (Georgian: ბათუმი) is a seaside city on the Black Sea coast and capital of Adjara, an autonomous republic in southwest Georgia. It is situated some 20 km (12 mi) from the Turkish border, in a subtropical zone, rich in agricultural produce such as citrus fruit and tea. Industries include shipbuilding, food processing, and light manufacturing.Batumi is a city which visitors can’t help but fall in love with. Its unique blend of subtropical coastline framed by rich green mountains and topped with legendary nightlife. The health giving qualities of this combination of sea and mountain air is renowned, and perhaps one reason why Georgia can boast twice the world average of centenarians. The fields around the city are mostly tea and citrus plantations, spotted with ancient ruins. Batumi is located on the site of the ancient Greek colony in Colchis called Bathus or Bathys - derived from the Greek phrase bathus limen or bathys limin meaning "deep harbor. "Under the Roman Emperor Hadrian (117-138 AD), it was converted into a fortified Roman port later deserted for the fortress of Petra founded in the times of Justinian I (527-565).Garrisoned by the Roman/Byzantine forces, it was formally a possession of the kingdom of Lazica until being occupied briefly by the Arabs who did not hold it; in the 9th century it formed part of the Bagratid monarchy of Tao-Klarjeti,and at the close of the 10th century of the unified kingdom of Georgia which succeeded it.Batumi today is the main port of Georgia. 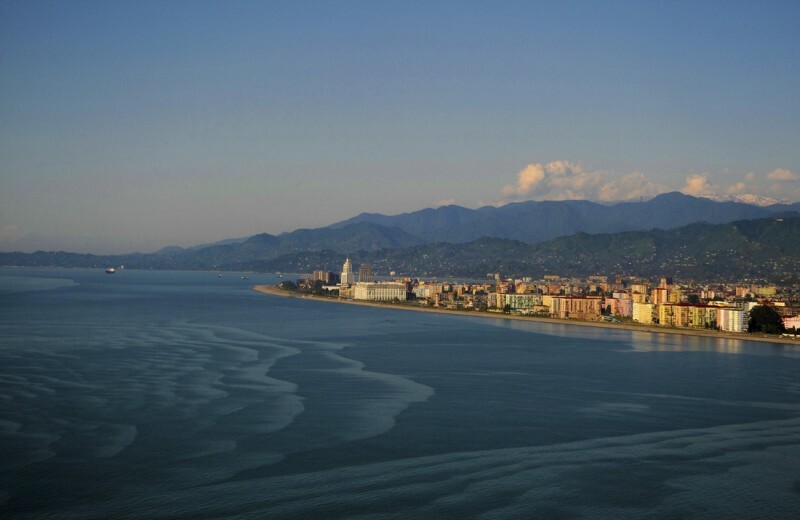 Since the change of power in Adjara, Batumi has attracted several international investors with real estate prices in the city trebling since 2001. Kazakh investors have reportedly invested $100 million to purchase more than 20 hotels in the Adjara region of Georgia. Construction of a number of new hotels was launched in Adjara’s Black Sea resorts starting in 2007.Influenced by the onshore flow from the Black Sea, Batumi is subject to the aerographic effect of the nearby hills and mountains, resulting in significant rainfall throughout most of the year, making Batumi the wettest city in both Georgia and the entire Caucasus Region.Batumi is Georgia's number one beach resort. The open waters of the Black Sea connect Batumi with Russian, Turkish and European ports - as does its new international airport. The nearby beaches at Kobuleti and Sarpi are well resourced with hotels and restaurants. The architecture of Batumi is particularly refined, the city being constructed at the height of Art Nouveau when it stood as the primary gateway from Western Europe into Georgia. Its streets are dotted with architectural wonders, including a mosque, synagogue and lovely churches. More recently, Batumi’s economic boom has seen investors flood in, and Batumi is being transformed into a vibrant, modern resort. Top end hotels like Sheraton and Hyatt have opened, and the clubs, nightclubs and restaurants in Batumi are the best on the Black Sea.